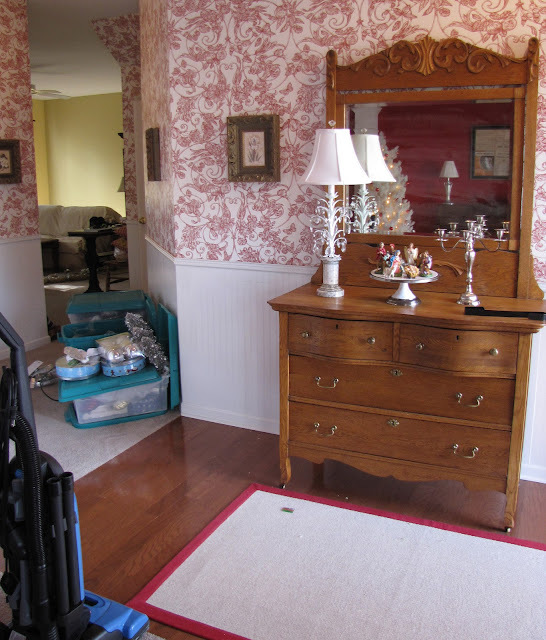 It was late last night when I finished up the foyer, Music Room and Dining Room. Too late, and I tried, to take any decent pictures. and I can see things anew again, today! 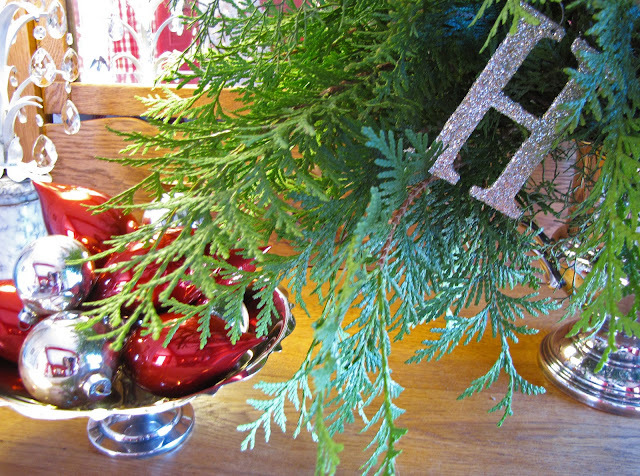 (click here to see Day 1) and I have a tinsel hangover today. And picked out only the most specialest and simplest items. I vacuumed up glitter and sorted through more things. 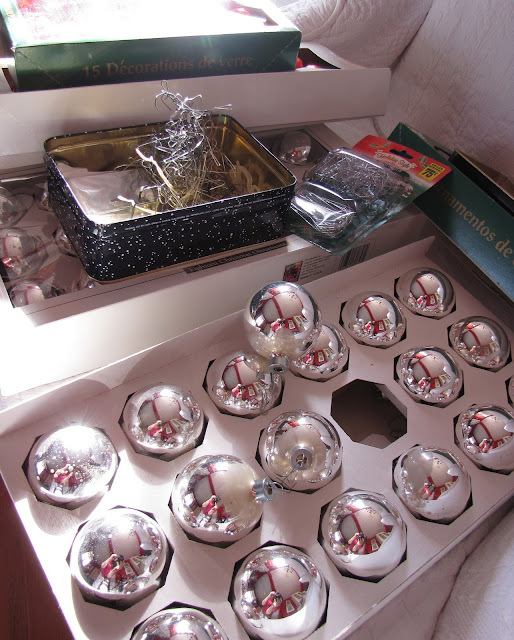 It is harder to go through many frou frous and keep those items that still say "festive"
than just putting everything out like I did last year, I decided. I got to wake up to find what I thought was simple to me yesterday. I paid $7.50 for this vintage bottle bottlebrush tree! 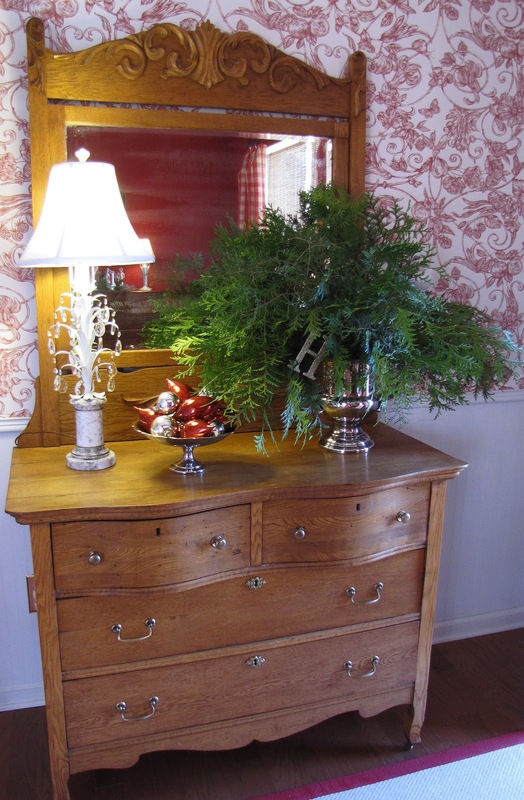 An antiques store was going out of business, and the tree was $75.00 with 90% off! 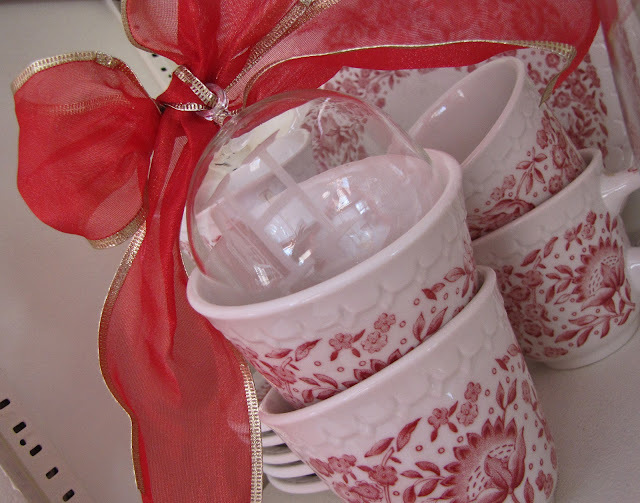 and plopped them in some sugar water in the urn that usually holds utensils next to the stove. 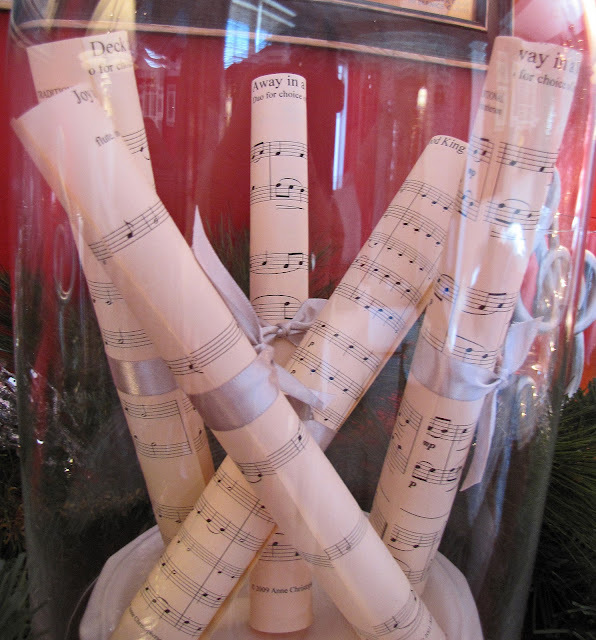 I printed sheet music from this site, rolled it up and tied it with gray satin ribbon. Battery-operated candles from Hobby Lobby on clearance for $2.80 each, in the Fall. 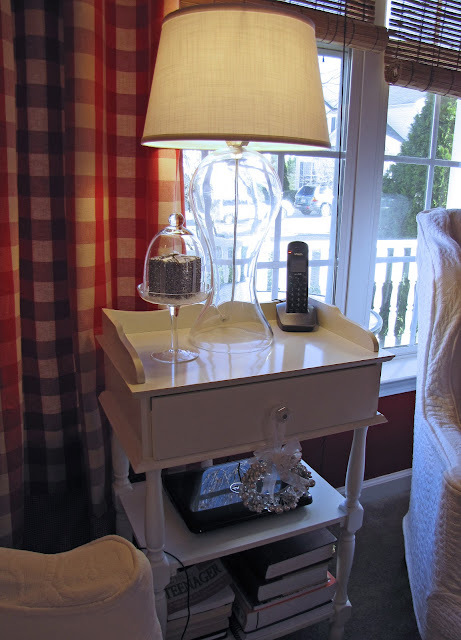 Where we read and surf the net. Jesus is the gift AND the giver. 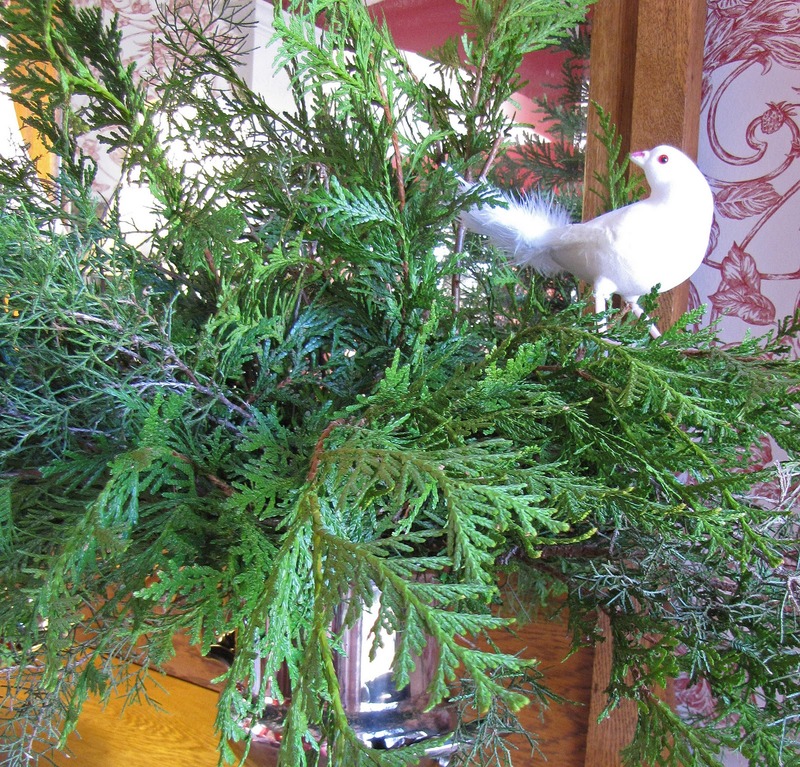 One of many from the collection of vintage flocked birds I found at an estate sale. Smaller red ones on the chandy- another estate sale. Syracuse china- Roxbury pattern, a gift from a dear friend. Not really, it's our last name's initial. laid it on the table and gussied her up. The next area is the livingroom, Day 3. Gorgeous! Thank you for sharing--I'm going to keep this post in mind while I continue to decorate our home for the holidays. Such beautiful decorations! Love it. Lovely decorations!! You really do have a special way of decorating. Love it!! It is so beautiful!!!! 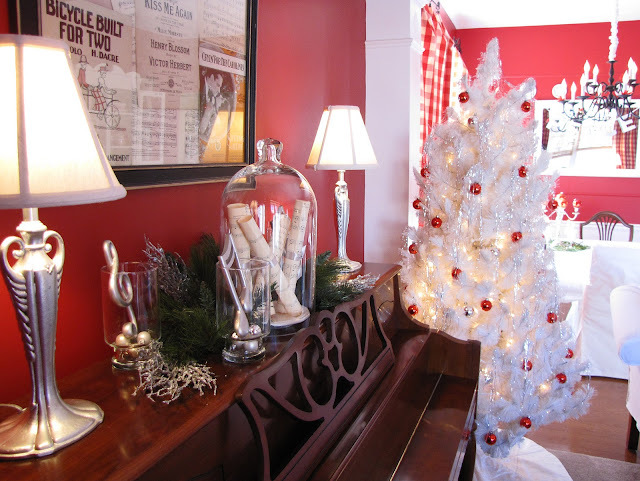 I love the red and white and I adore the music sheets under the cloche!!! You did an amazing job and can't wait to see day 3!!! 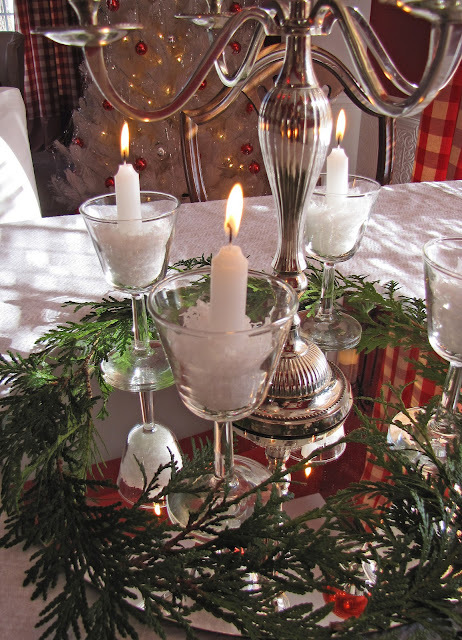 I too REALLY like the Carols under the Cloche. Gave me inspiration for my very sparse Piano top!! Every thing is looking good! Gorgeous! The red and white is just beautiful. 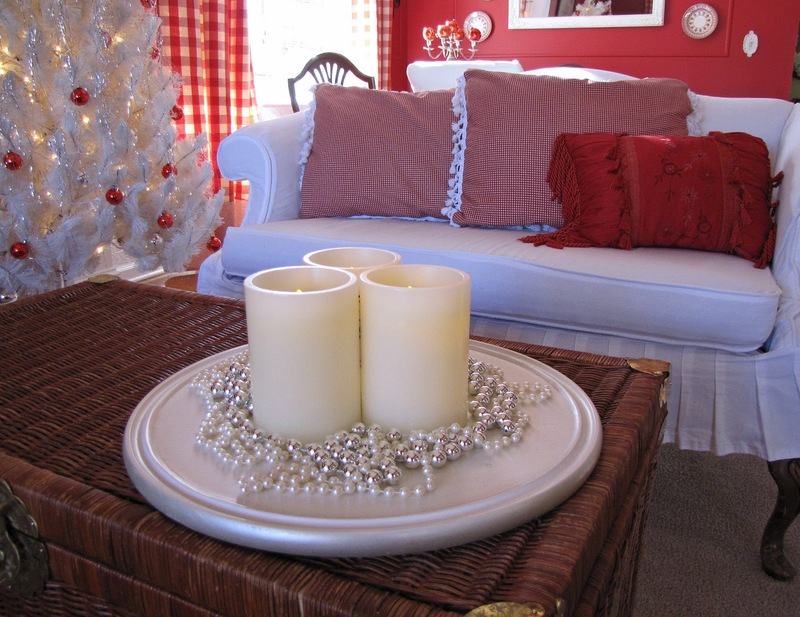 Your home is looking so lovely and festive! 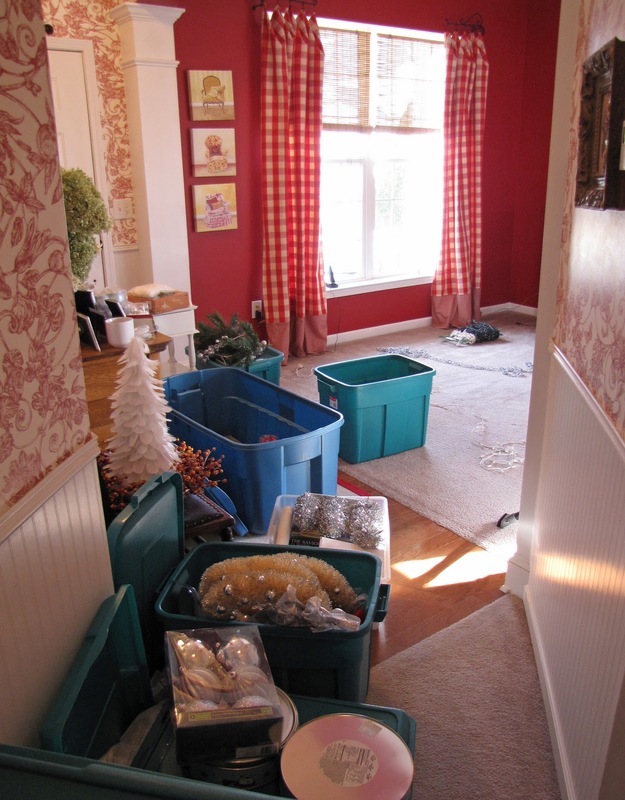 Actually that room looked Christmasy before ya even got started!! I SOOOOOOOOOOOOOO love that tree......I am shocked at the buy you got....SHOCKED!! Your home is absolutely beautiful! I wish I could find a deal on a tree just like that. God is good! OMG! I love everything about this room! 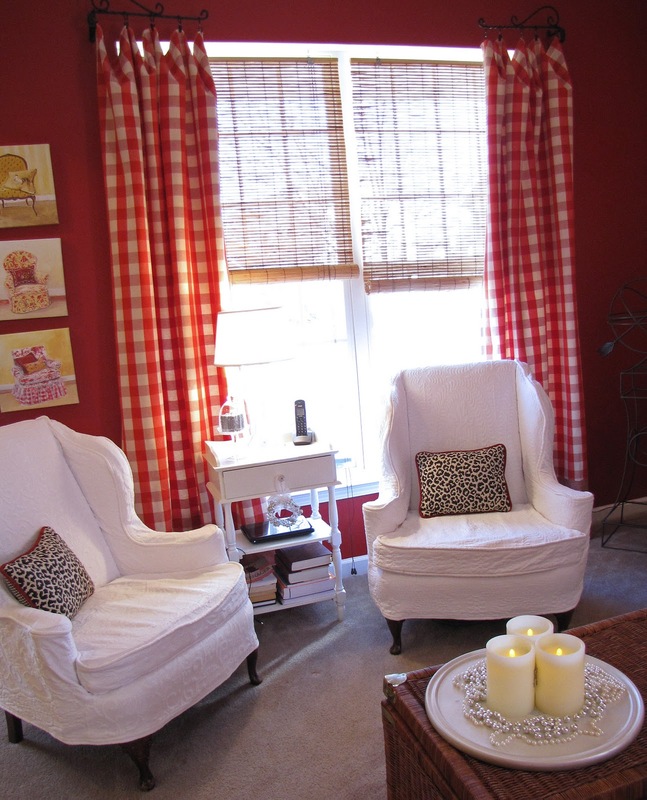 The curtains,forget it when I got off the floor I was still in love.lol I am so lookin for that fabric or somethin similar for my office area.Gotta love blog land! Love your home and I am gonna go and see your closets now. Gorgeous, Leslie, simply gorgeous. 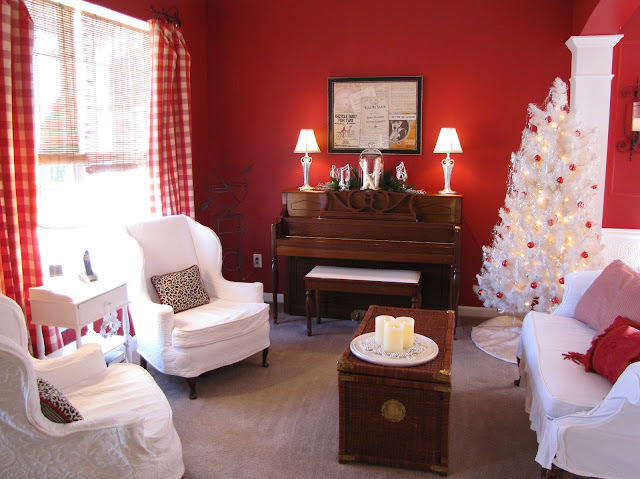 Your red and white room is perfect even without the Christmas decorations. Can't wait for part 3. Wonderful Leslie, it's all so pretty! I wish I had better shrubs to trim to bring into the house. Just an old pine. 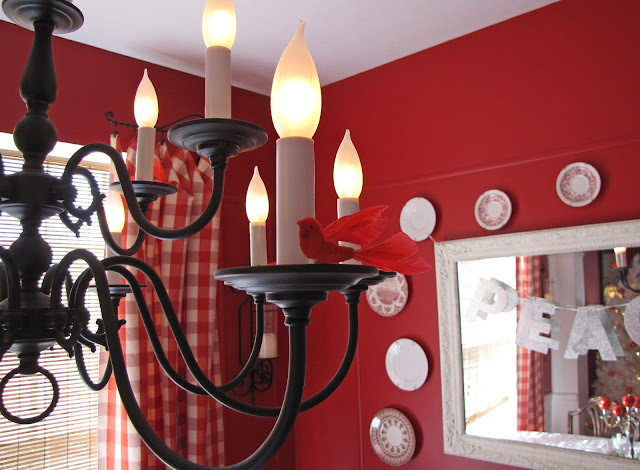 Wow...I thought I was a lover of red and white...but you walk the talk! Your rooms are just beautiful, simple but elegant. I can hardly wait to get my Christmas boxes back down in the basement and out of my foyer. It's beautiful! And what a DEAL on that tree!! I love it!! 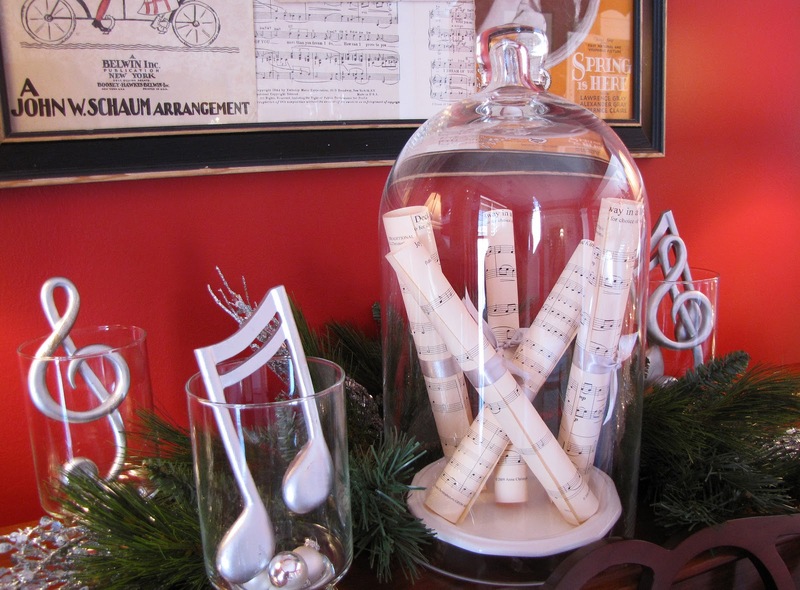 Love the music rolled up under the cloche! 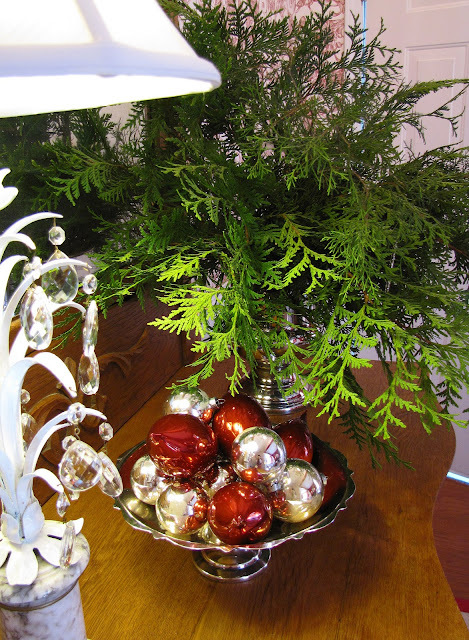 And the greenery in the urn next to the ornaments! Truly stunning! Leslie, it's all so pretty! 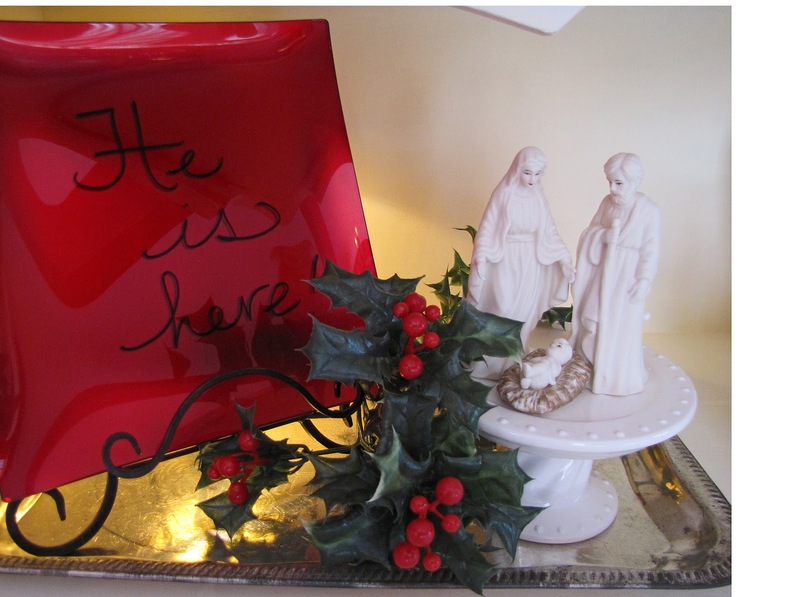 I think many of us are feeling the need for a simpler Christmas this year & I certainly did that. 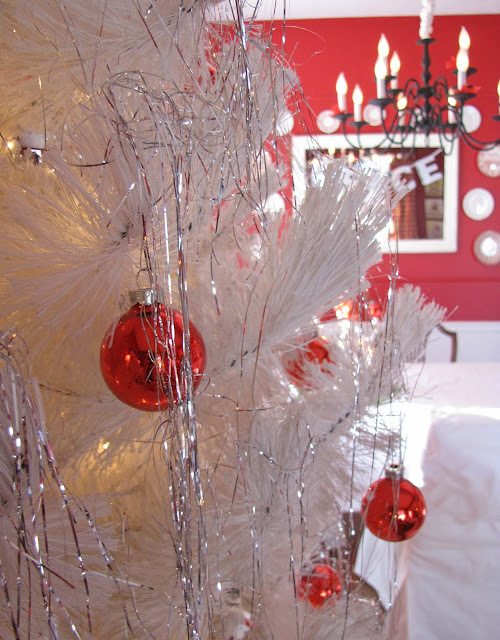 I love all your little touches, your red & white are perfect for the season. Gorgeous white tree and fresh greens. Love it all! Merry Christmas to you and yours. Your home looks wonderful. I love the sheet music wrapped in ribbon. Leslie, Everything is beautiful! I love the bottle brush tree and what a deal you got on it. I hope to see you at my party starting 12/15. May be simple to you, but it is truly beautiful. I think all of your displays are lovely. Love.it.all! Red and white are just the best color combo and you've added just the right touches. How beautiful! The red and white is such a delught to see anytime of year, but with all your magical touches, it just pops at Christmas time! It all looks so awesome! I was thinking about you and praying for you today my friend! Hope things are going well! I absolutely love your red and white room...WOW! Hey girlie. . . I enjoyed this tour of simple. Simple but beautiful, I'd say! 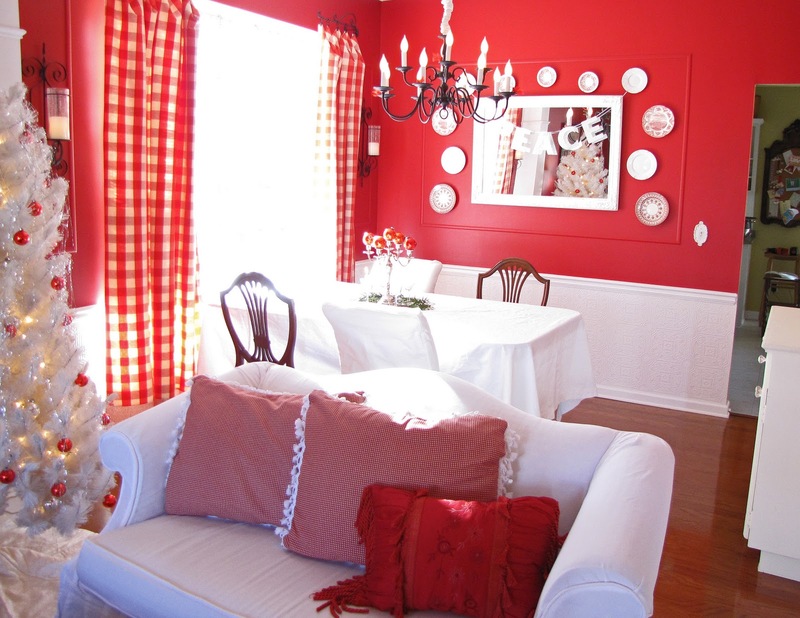 Isn't it amazing how red rooms look at Christmastime? My dining room is one of my favorite rooms to decorate. I often think "Oh, I should get rid of the red. . . I've had red for so long. . . " but then Christmas rolls around and I'm smitten again. You know? 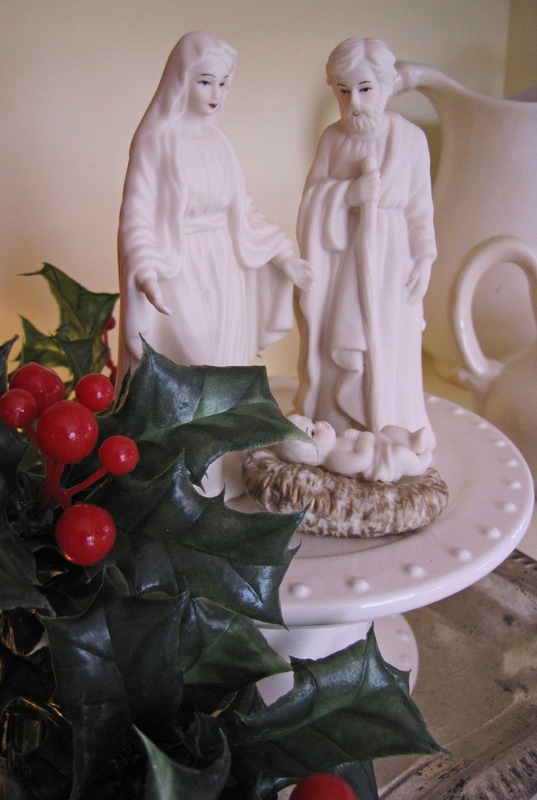 Hope you're having a WONDERFUL Advent season! It looks beautiful Leslie. Yes I went simpler too this season, and I feel so more relaxed because of it. 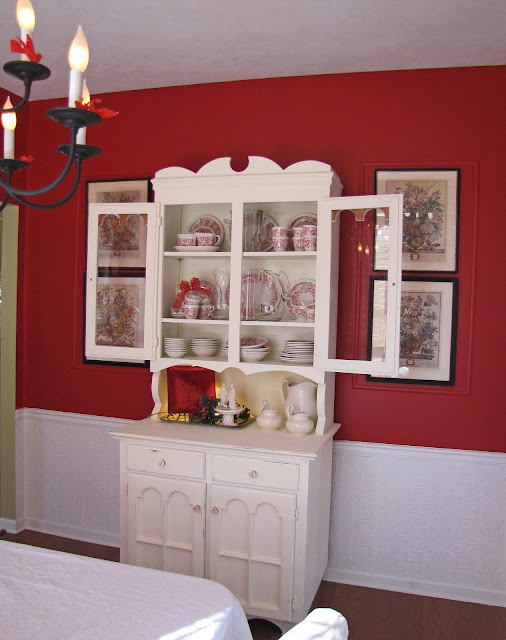 I love your red dining room, always have! Happy Holidays to you. 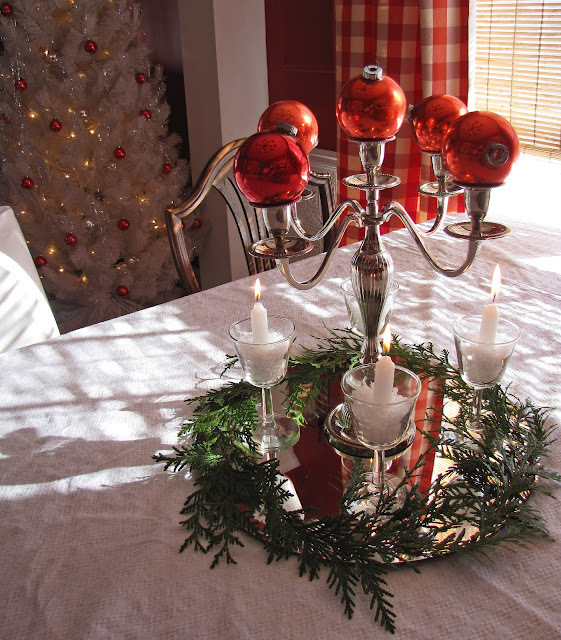 Using ornaments in place of candles on the candelabra?! Amazing! What great ideas you have! I may borrow some for next Christmas. Oh girl...You got my kinda house! 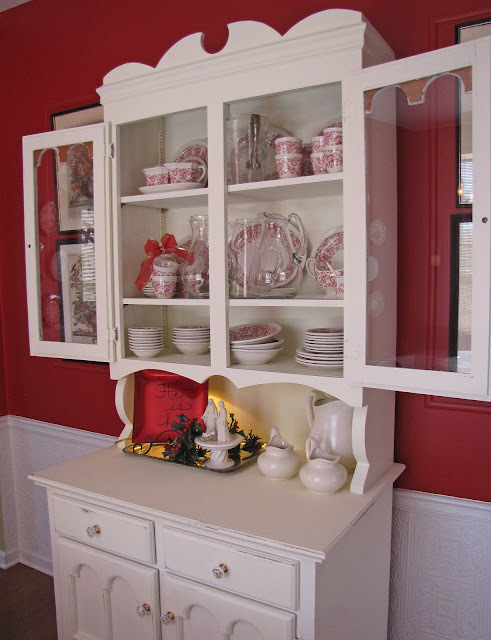 I love, love, love the sheet music under the cloche, the red transferware, the ornaments on the candleabra, and so much more! I'm so glad you found my site, because now I have found yours!!! Everything is lovely! OH MY GOSH--this is breathtaking!! 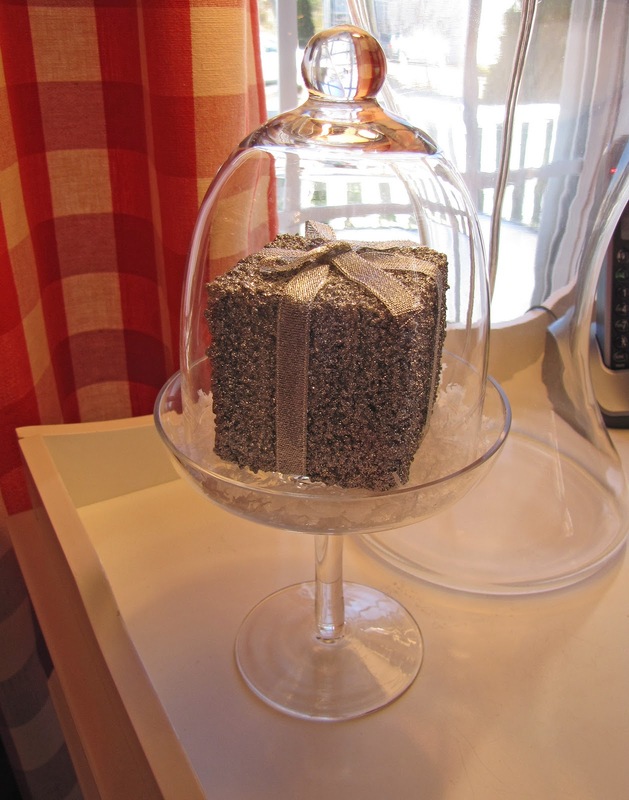 and I adore your red and I love the rolled sheet music in the cloche!